Inclusionary zoning – This is esssentially an affordable housing requirement as a % of total units, often 15%-20%. San Diego, Tallahassee, Palm Beach, and Key West, Florida, have recently passed such ordinances. L.A. requires 20% of housing in downtown projects to be affordable, and in the Washington DC any government assistance is coupled with an inclusionary housing requirement. Parking reductions – The costs from parking requirements alone can kill a project before it ever gets started. L.A. reduced the parking requirement for projects within 1000 feet of a transit center to 1.25 spaces per unit from 2.25, and the city of Miami allows developers to provide residential parking off-site. 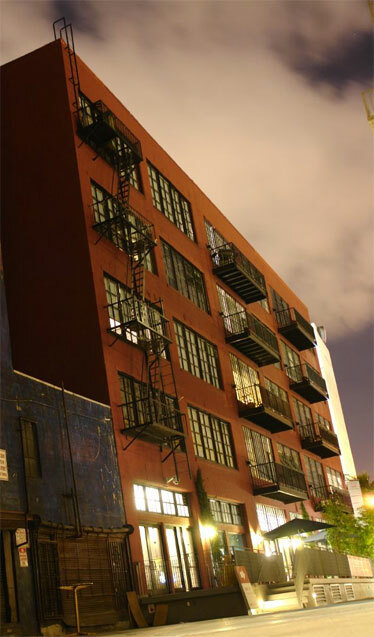 Inexpensive quality building materials – As JetBlue proves, you can be hight style at low cost, like the concrete and exposed-brick-wall exteriors at Santee Court (pictured) in downtown Los Angeles’s Fashion District, and Chinese granite countertops instead of Italian stone. Smaller homes – There are several dozen entries on this in the Housing & Lofts section. The bottom line is households are shrinking, and so should homes. Financing options Trusted developer-construction partnerships create cost efficiencies. Triple-bottom-line-oriented investors will accept lower-than-normal profit margins of 9-10% rather than the normal 15-20%. Low-interest financing via government programs, low-income tax credits, historic tax credits and new market tax credits all significantly lower housing costs. Land trusts – See previous entry. Nonprofits and cities purchase land reserved for workforce housing.